CNN's GUT CHECK | for May 8, 2013 | 5 p.m.
MORE: For a full account of the House’s Benghazi hearing, scroll down to What Caught Our Eye. MARKET WATCH: Dow adds 48 points to close at record high. S&P gains 0.4% to also hit new record. How many presidents have been only children? In what seemed like a response to Hillary Clinton's Senate testimony – in which she said “what difference, at this point, does it make” over how the violence started – Eric Nordstrom stressed it was important to get to the bottom of the attack. In describing the night to the committee, Greg Hicks discussed how he found out about the Benghazi compound coming under attack. Hicks said he received a call from the then-U.S. Ambassador to Libya Chris Stevens while the compound was being stormed. Although former Secretary of State Hillary Clinton was not mentioned at length during the hearing, Democratic Rep. Carolyn Maloney of New York defended former the former secretary of State. “I find it truly disturbing and very unfortunate that when Americans come under attack the first thing some did in this country was attack Americans, attack the military, attack the president, attack the State Department, attack the former senator from the great state of New York and former Secretary of State Hillary Clinton, and I would like to ask some questions about these attacks to get at the real facts,” Maloney said. U.N. Ambassador Susan Rice was the face of the administration in the days following the attack, and maintained in several media appearances its account of events – that the assault on the compound was the result of a demonstration that turned violent. For more from the Benghazi hearing, check out the CNN Politics live blog. None. No presidents have been only children. While Presidents Franklin Delano Roosevelt, Gerald Ford, Bill Clinton and Barack Obama were the only child born from the parents that produced them, all had half-siblings and therefore are not considered only children. Roosevelt had a much older half-brother – James. Ford had a half-brother and two half-sisters by his father’s second marriage and three half-brothers by his mother’s second marriage. Clinton had one half-brother, Roger Clinton Jr. and Obama has one-half brother, Malik, from his father’s first marriage. That said, even though every president has had some sort of a sibling, Gut Check can’t confirm whether they liked them. Congrats to Erin (@Erin_in_AR) for correctly answering today’s gut check trivia question. 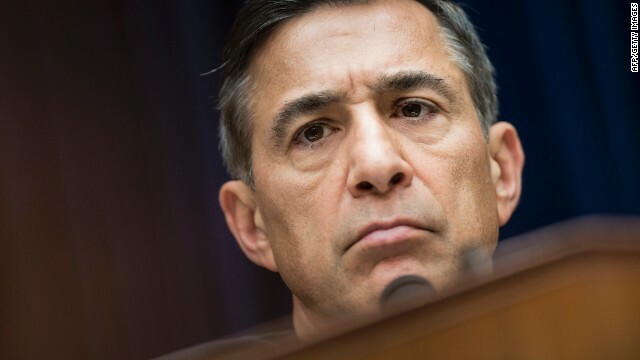 "Our goal "is to get answers because their families (of the victims) deserve answers," said California Rep. Darrell Issa"
But the Newtown victims apparently didn't even deserve a vote. Grandstanding witchhunt with a tight script. That's all we witnessed today. And CNN still refuses to report in any way on the grand partisan histories and ties to the GOP...including being paid hundreds of thousands of dollars by the GOP congress during the Clinton-Lewinsky scandal...of the attorneys claiming to represent these witnesses (diGenova and Toensing). Why? Because that would somewhat rain on the parade CNN has scheduled and would make it far harder to mischaracterize grandstanding, pontificating Republican conspiracy salesmen and their coached witnesses, whose testimony wasn't all that damning really, as having "ripped" the POTUS etc. And why no reports on the fact that Issa refused to let Ambassador Pickering testify? Same reason. Any peeking behind the curtain is not allowed when the GOP/Teatrolls are feeding the MSM the salacious red meat manufactured controversies it needs to perpetuate a 24/7 "news" cycle and give their bobblehead pundits something to chatter about. # 1 ) Benghazi – that horse has been beat to death – how about the 5000 + that died in Iraq ? How about Afghanistan ? & the list goes on – Yes, the Obama administration should have gotten the memo – and Yes, they had people only 2 hours away – in Italy, or somewhere- but the republicans are not going to let up on this one. Truth be known, Obama will probably not ever live that down. It's a mistake – It was an accident – I'm sure IF they (the administration) had it to do over again, they would have gotten that crew in there from Italy, or wherever the closest base was, to help those guys get Out. But It's Past Tense. Go & Learn from this. I mean, come ON, we were once "under attack" at pearl harbor. # 2 ) As far as the "unfit" 17 goes – they need to abide by the rules – plain & simple – maybe they need a "re-fresher" course. # 4 ) The FLOTUS ? well, she said good words about Christy – what else can I say ? # 5 ) Graham & the "freedom works" president Kibbe ? LOL – well, ever since Obama got reelected, they GOP has been having "infighting" within their own group. Sounds like 1/2 of them don't agree with one another, in some way, shape or form. # 6 ) As far as 'ol Mitch "Lashing out" LOL – This guy would "lash out" at his own Mother over anything trivial, It's a wonder he gets along with his wife, in my opinion. # 7 ) and Sanford ? (that's a bigger laugh of the day) LOL – well, all I can say for S.C. is – – Good Luck, & Congrats ! Assa, the gop stooge and nra lacky for the brain dead gop and champion of wasting taxpayers money on useless hearings trying to tarnished Mrs Clinton will just cause more of us to vote for her .some dem should run againest this clown who doesn't represent his district ,and just wants his ugly face on tv ,see you in the mid terms assa. Fascinating- despite the expected hyperbole and overheated rhetoric, the GOP today produced... vapor. Evene manufacturing the hearing about this tragedy one would expect something- maybe even anything that might shake the status quo. Conspiracy theory.. space aliens... anything. Nope, NOT like Watergate. Meanwhile the hypocracy is piled ever higher. Issa is a piece of work. Tell it to the families of the 4 dead Americans that died as a direct result of Obama and Hillary Clinton's incompetence. Would you say the same thing if it was one of your children that had died? So, wise Donna, what would have prevented the attack? Hmmmm? We had NO TROOPS in Benghazi, the nearest air base with troops was in Italy, and the American diplomatic corp and their security were in Tripoli (look at a map). You know the GOP cowards act like the world ends when brave Americans die doing a hard job in a difficult place when it suits them. Otherwise they could care less. Do you have the slightest inkling on how many places around the world Americans are stationed conducting non-military work? That one place got attacked on one night resulting in deaths is a tragedy, but statistically irrelevant. Those diplomats knew the risks- that is what makes them brave and Republicans just bad actors. If the death of children affects you I imagine you were crushed by Newtown, and support full gun control. No? Then you're just another GOP hypocrit. "Would you say the same thing if it was one of your children that had died?" Nah...I'd probably just filibuster legislation designed to help stop it from happening again and then happily take campaign donations from the lobbyists who asked me to do so. Wait...we were talking about Newtown, right? I voted for Obama in both elections and am,..or was looking forward to voting for Hillary. But now it looks like they both first totally messed up the reaction to the Bengazi attacks and then totally covered up their incompetence. I just cant bring myself to vote either of them ever again. Oh, and back when Bush was Prez, we tried our best to bring charges and hearings onto Bush but there were just no facts or solid evidence to enable us to do this, that's why there were no special hearings or trials on Bush. We lied and lied and lied, just nothing seemed to stick. But now I hope Obama and especially Hilliary get totally busted. Maloney uses the word "attack" in describing those murdered in Benghazi and those in this administration getting heat. Absolutely unconscionable! 1 question to all you posters out there, what does Iraq and Afganistan have to do with Benghazu? They are totally different places and the circumstances were totally different. Many Democratic Representatives voted for those wars also. Bush didn't just send our people and equipment to fight like Obama did to Libya. He asked congress like he was supposed to. And congress approved it too so he wasn't the only one that was misinformed. Funny no one notices Syria has WMDS in spades and they're right next to Iraq wonder where they got them from?